The nanny-staters are at it again trying to save people from cutting off their fingers and limbs by accident. Technology developed in 1999 provides a way to stop saws from spinning and saving fingers and limbs from being chopped off. And now the federal government in the USA wants to require safe saws. In 2015, 4,700 people in the US lost a finger or other body part to table-saw incidents. Most of those injuries didn’t have to happen, thanks to technology invented in 1999 by entrepreneur Stephen Gass. The Consumer Product Safety Commission (CPSC) predicts switching to the safer saw design will save society $1,500 to $4,000 per saw sold by reducing medical bills and lost work. Note how the nanny state disparages the business by calling them unscrupulous just for providing an alternative that the nanny state doesn’t like. As usually the nanny state wants to impose its opinion on what is good food on everyone. Why do nanny states continue to act as though people don’t know what they should eat? They continue to act as though we need nanny states protecting us from harmful products and food when people just want to be free to buy unsafe food if that is what they want. The artificial food products are popular with restaurants to display menu choices as they always look fresh and never rot. Artificial rice is made of PVC, a white, brittle plastic. See, once again the Nanny State was being foolish. Now, I suppose some people might say the bags should be properly labeled to avoid people making foolish assumptions but why would we want to make things easy and avoid funny misunderstandings? Samples of store-brand aloe gel purchased at national retailers Wal-Mart, Target and CVS showed no indication of the plant in various lab tests. The products all listed aloe barbadensis leaf juice — another name for aloe vera — as either the No. 1 ingredient or No. 2 after water. ConsumerLab said it tested a dozen aloe products, including pills and juices, and just half the items appeared to meet the claims on their labels. I suppose nanny-staters would expect the government to protect people from false claims by businesses. Obviously that isn’t a good idea. If people want to be sure products they buy contain Aloe Vera they can just test their purchases themselves. They shouldn’t expect the government to spend resources protecting them. A new report from the nanny staters at the The American Road and Transportation Builders Association reports on the unsafe bridges in the USA. The US Federal Highway Administration acts like it is the nanny states job to determine if bridges are safe for our cars and trucks. We don’t need the nanny state acting like we are kids that need to be coddled. If we see unsafe bridges we can just stop and turn around and go somewhere else. On highways this might be difficult but we can just stop before the last turn off for each bridge and send our drone ahead to inspect the bridge and then turn off if it is unsafe and take a different route. Why does the nanny state act like it has to protect us from dangers? They really need to stop being such busy bodies and leave us alone. The nanny state reported that 29,505 of 143,139 bridges on the national highway system were deficient. And they encourage other parts of the nanny state apparatus to make those bridges safe. They don’t seem to realize if we want to drive on safe bridges we can do that for ourselves, we don’t need a nanny state trying to make all the bridges safe for us. Yet again the nanny state thinks they know more than you and your doctor. Just because the nanny state thinks you are healthy doesn’t mean your doctor doesn’t know better. Certainly you don’t need a nanny telling you that your doctor can’t be trusted. You chose your doctor because you trusted them, if you didn’t want extra surgery you wouldn’t have chosen a doctor that liked to operate on what others see as health hearts. A cardiologist who ordered patients to undergo unnecessary open heart surgery and performed risky tests and procedures in order to reap fraudulent payments from Medicare and private insurers has been sentenced to 20 years in federal prison. Dr Harry Persaud, 56, from Westlake, Ohio, may have put lives at risk and threatened people’s health while making more than $7m from manipulating patients’ “sacred trust”, federal investigators found. The FBI said he performed unneeded nuclear stress tests and recorded false results in order to justify catheterization, in which a tube is inserted in a blood vessel via the groin, arm or neck and into the heart, as a further diagnostic test. He then falsely recorded that patients were suffering blockages. Dr Persaud inserted cardiac stents in patients who did not need them and sent patients for bypass operations performed via open heart surgery, so he could perform follow-up tests and bill for them, investigators found. The nanny state sure thinks they know better than patients. Certainly patients wouldn’t chose a doctor that can’t be trusted. Why does the nanny state insist on trying to meddle in people’s health? We chose to donate to charities that we wish to. Why should the nanny state go bothering those charities to see whether the state approves of what they do? Not all of us want to donate to the needy or to the arts or to improve society. We may want to send those running the charity on vacations instead of focusing those dream vacations on people with terminal cancer. The nanny state shouldn’t judge those charities we choose to donate to. But of course that doesn’t stop the nanny state. The Federal Trade Commission and 58 law enforcement partners from every state and the District of Columbia have charged four sham cancer charities and their operators with bilking more than $187 million from consumers. The defendants told donors their money would help cancer patients, including children and women suffering from breast cancer, but the overwhelming majority of donations benefitted only the perpetrators, their families and friends, and fundraisers. This is one of the largest actions brought to date by enforcers against charity fraud. They don’t know the thoughts of those giving to the charity. We are not fools. We don’t give money away without studying how it is spent. If we needed the nanny state to tell us how to spend our money we would ask. According to the complaint, the defendants used the organizations for lucrative employment for family members and friends, and spent consumer donations on cars, trips, luxury cruises, college tuition, gym memberships, jet ski outings, sporting event and concert tickets, and dating site memberships. They hired professional fundraisers who often received 85 percent or more of every donation. When we choose to give it to organizations that treat their staff well that is our choice. The complaint alleges that, to hide their high administrative and fundraising costs from donors and regulators, the defendants falsely inflated their revenues by reporting in publicly filed financial documents more than $223 million in donated “gifts in kind” which they claimed to distribute to international recipients. Donors certainly understood this. The nanny state acts as though they know better than us what we want to give money to support. Nanny state thinks it should interfere with free choice of drivers doing what they feel like doing. Once again the nanny staters want to discourage free people from doing what they see fit to do just because they may kill themselves or others. Sure texting while driving endangers the driver, their passengers and anyone else on the road with them. Sure many deaths and critical injuries have resulted from texting while driving. We have known drinking with driving and talking on a cell phone while driving endangers ourselves and others for a long time. Still, people choose to drink and drive or choose to use talk on the phone while driving. Those choosing to do so know they are risking their lives, their passengers lives and those on the road with them. Yet millions do it anyway. If we wanted nanny state protections from deathly risks we could choose to not take foolish risks. And sure texting is even more dangers that hands free phone calls or driving drunk but why does the nanny state have to get involved? Only to save lives and prevent injuries. Why would we want to give up freedom just for to save lives and prevent injuries? Sure, distraction and teen crashes is even worse than we thought but we can’t let the nanny state win. The results showed that distraction was a factor in 58 percent of all crashes studied, including 89 percent of road-departure crashes and 76 percent of rear-end crashes. NHTSA previously has estimated that distraction is a factor in only 14 percent of all teen driver crashes. Who knows what the nanny state would do next to try and save lives and protect people from harm? As we said earlier, if consumers want safe milk they can test it themselves. Why should the government seek to help citizens be safe when we don’t want a nanny protecting us. If we want to know if where our baby is safe from unvaccinated people, we can just ask every person if they are vaccinated before we bring our baby into the airplane or shopping mall or theme park. This isn’t tricky stuff. We don’t need a nanny state making things safe for society. If we want to protect ourselves, we can do the research and testing ourselves. It is odd to think some people believe safety rules and regulations are needed when ancestors 20,000 years ago didn’t have any such things and we descended from them. They must have gotten along fine, otherwise we would be here. I suppose some people might argue a social contract makes sense when we form urban societies where some might want expectations of safety and protection: from thieves, fraudsters, other criminals, unsafe products, unsafe medical practices, abuse by those with authority, unsafe roads, etc.. But that seems crazy. If we need safety we can just do the testing and research ourselves and avoid anything where we haven’t been able to independently access the safety of. Thinking we are society of people interacting with each other and with obligations to society is reckless. It is much better to live in a nanny free state and view ourselves as individuals with freedom to behave however we want with the understanding we are on our own to protect ourselves from all the others that may not feel like providing safe services or products. It may seem a little daunting at first but I am sure we can figure it out without nannies. 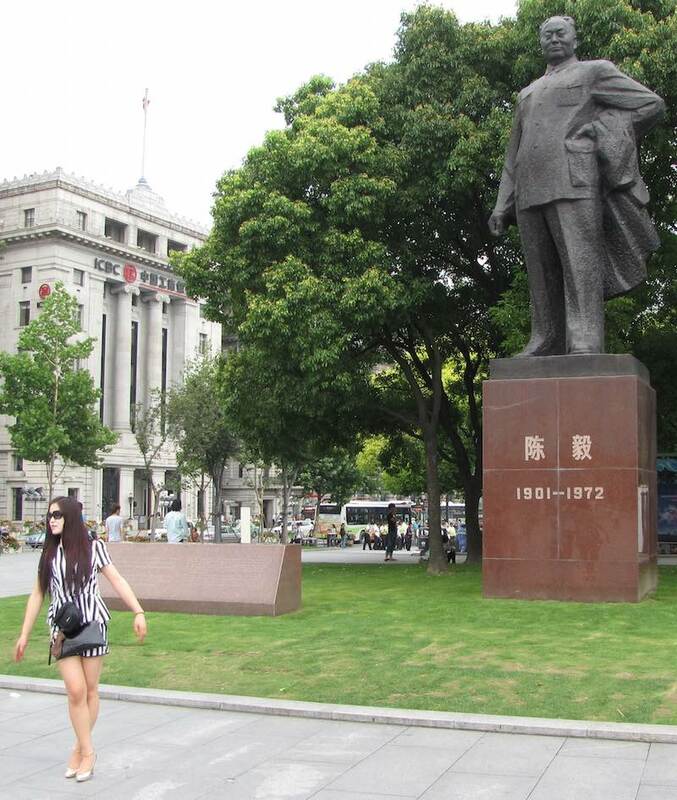 Statue of Chairman Mao, Shanghai, China. Do people that believe in safety regulations want us to model our government on Chairman Mao’s policies? Of course the Senator’s desire that the freedom of Starbucks be limited and they give notice of what safe practices they avoid is reverting to the nanny state ideas. He is a freshman senator so it isn’t surprising he hasn’t figured out the logical extension of his belief. Over time he should be able to be more logically consistent. Once again the nanny staters are having the government act as our nanny. We don’t need the government figuring out if our drinks are dangerous. We can test the drinks ourselves if we want to protect ourselves. It should be obvious that we don’t need the Nanny State intruding if we are drinking alcohol. How many studies are there are about the risks of drinking alcohol? If we are trying to drink alcohol we can’t really be interested in out health can we? Just leave us alone, and stop acting like we need the nanny state to protect us from tainted drinks (or just watered down drinks or being served something not quite what we ordered). If the bars can fool us why should the nanny state protect us from them – the bars just took advantage of our stupidity or laziness and it serves us right. Sen, chairman and managing director of Saradha Group, said he owned 160 companies. About 15 operated as real firms, Sen’s lawyer Samir Das says. Unlawful deposit companies proliferate in India. Saradha took in at least $200 million based on preliminary figures, Sinha says. Actual numbers may be bigger, he says. Such firms have raised a total of more than $2 billion, Sinha estimates. Once again the proponents of the nanny state style look to government to ensure people can trust those organizations they use as banks. As we all know, people don’t need a nanny state to solve their problems. People should just do their own research and examine the banking enterprise to see how reliable they are, and whether they are using questionable methods similar to a ponzi scheme. It is no surprise the nanny state can’t keep up with all the fraudsters. People should just watch out themselves and not seek protection from the nanny state.